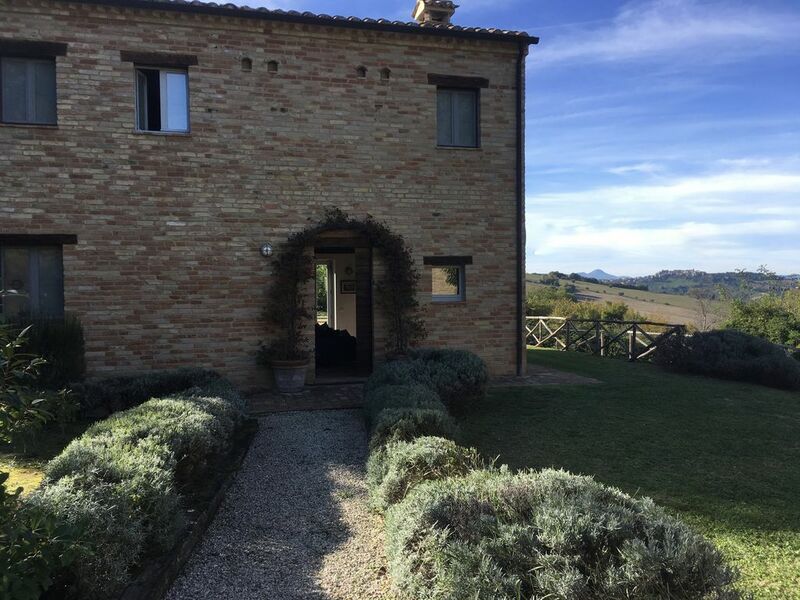 Stunning Le Marche 4 double bedroom farmhouse with private pool. Casa Isabella is a traditional Italian villa, renovated using local honey-coloured stone and cotto flooring. The stylish and contemporary interior is conducive to easy family living. Situated in rolling hills with views of open farmland and medieval hilltop towns, it nestles in 7 acres of land, a vineyard and olive trees dotting the hillside. Our private pool is easily accessed through French doors from dining and living rooms and across the terrace. The large open-plan living room with wood-burning stove has light flooding in through triple-aspect windows.The hand-crafted modern kitchen has a dining area with a large table seating 10. The house has all mod cons: dishwasher, washing-machine, satellite TV and DVD +xbox 360, CD player, iPod dock, cot. We also have internet access.There is a wet-room style shower/WC downstairs + family bathroom and en suite shower room upstairs, 4 bedrooms ,2 accessing a terrace. Outside there are loungers by the pool, a large umbrella plus a separate seating area with table, 8 chairs + umbrella. Booking is secured with a 25% deposit. Full payment required 8 weeks before arrival date. We also ask for a 300 UK Pounds security deposit, returnable after the property has been checked on departure. Payment by cheque or bank transfer. For booking and further information please contact owner. We ask you to arrive no earlier than 4pm and depart by 10am. Fly to Ancona or Pescara airport. 'Casa Isabella' is about 1.5 hours by car. Cheap flights available all year from Ryanair from London Stansted airport. Car hire available from the airport (Avis, Hertz, Europcar etc). At peak times it is best to book in advance. The three bathrooms are beautifully appointed, with stylish modern fittings. There is a separate Utility Room next to the kitchen, in which you will find the washing machine, an additional sink, the iron and ironing board, hair dryer etc. Please bring swimming pool towels, as these are not provided. The pool is open end of May - mid September and will be cleaned regularly. Please bear in mind that the pool is close to the French doors. This means that if you have young children it is easy to keep an eye on them from the house, but also easy for them to get to the pool if the doors are left open. The house will be cleaned for your arrival. Bed linen and bath towels are provided and will be changed weekly. We needed to rest, away from the phone and demands of any kind, in a sunny, beautiful place with a pool. Casa Isabella provided all this and much more. Very comfortable accommodation with a well appointed kitchen where we could cook the fantastic produce available locally (if we chose to cook). Lovely wines to sit outside with while we watched the spectacular sunsets over Massa Fermana in the distance. Some wonderful restaurants to sample (especially Vela in Porto san Giorgio). We walked in the Sybilline Hills, actually significant mountains, in the National Park. A beautiful region full of legends and history. They also make some of the best shoes in the world in the Marche. Thanks you so much for taking the time to write such a positive and informative review. After a holiday, sitting down to write about it is often the last thing one feels like doing! It is so helpful for our prospective guests to get a feel for the place. We'd love to welcome you back to Casa Isabella any time you decide to return to the beautiful Marche region in the future. We had a lovely stay in this beautiful property. The house was immaculate and had everything one could want. The open-plan layout is very appealing. Views of the surrounding countryside are spectacular. Le Marche is a beautiful and unspoilt region and Macerata is well worth a visit. Jane was great at providing information. Many thanks for this lovely review. We're so pleased you found Casa Isabella provided you with everything you needed for a relaxing holiday. Also that you enjoyed the fabulous Marche region. We would love to welcome you to Montegiogio again! Casa Isabella is a wonderful spacious house with everything we could possibly have wanted. Beautifully converted, decorated and furnished. All bedrooms and bathrooms very nice - don't think our kids really appreciated their balcony! Great pool - we hit a really hot week so were very grateful for it. I think it was better than the listing portrayed. The Marche region is not so much on uk tourist radar and it seemed not too expensive to eat out etc. Lots to do. Montegiorgio isn't far from the coast but its worth going a bit further north to Numana, Sirolo and the Conero area. The owner was great . Lots of info on what to do where to eat etc , much of which we used. Great customer service. Would definitely recommend the property - in fact already have. We are so pleased that the holiday was such a success, and that you enjoyed staying in Casa Isabella. Yes, the pool is a welcome refuge from the heat of the summer! The Conero cost is indeed lovely, and quite different from the charming, typically Italian seaside resort of Porto San Giorgio, which is closer to Montegiorgio. The lakes provide another quite different and rather spectacular waterside scenario. Many thanks for taking the trouble to write the review....it is much appreciated. We, six grown-ups and one toddler, had a perfect holiday in Casa Isabella in July. We truly enjoyed the house, the patio and the the pool. We would say that the house is nicer than in pictures. What appealed us particularly as we are Nordics, was the straight-forward interior decoration. We also appreciated greatly Jane's spot-on, brilliant advice on restaurants, beaches and shopping sight-seeing. Million thanks for that! The house is a perfect base for exploring Marche, it is also a lovely place for relaxing by the pool. One should note however, that you do have to have a car there. Thanks so much for taking the trouble to write up your experience of your holiday at Casa Isabella. It is really helpful for future holiday-makers. We are really pleased you all had a good relaxing time in the house.... from toddler to grown-ups!...also that the information pack was helpful. As you clearly found out, there is plenty to see and do in Le Marche! This is one excellent house nicely located in the Marche. It is on the outskirts of a charming little village and you will definitely be needing a car. The house itself is, although looking old, brand new, which is nice, as everything will work. The furniture is a most tasteful blend of Italian furniture, Ikea and modern pieces by Kartell and it has all facilities you will need. There is a nice pool right outside the kitchen entrance, thus providing total control of the wherabouts of your children. The pool is taken care of twice a week and always in beautiful shape. There are four double bedrooms, one with an en suite bathroom, en extra bathroom upstairs and a bathromm with shower downstairs. Casa Isabella will easily house eight people. Linen is changed once a week and there is a local person you can contact if any problems should occur. The location is perfect, far away from the neighbors so that you will never be concerned for your children to raise their voices too high and thus disturbing the neighbors, yet not isolated. The nearby village is charming and it is a short drive to Porto San Giorgio and the coast. Shopping is excellent, the biggest Tods and Prada outlets ever are a 15 minutes drive away. There are numerous outlets in Civitanova (and for those who care one excellent Harley Davidson/ Buell shop). Thank you so much for taking the time to review your holiday at Casa Isabella. Your detailed comments will be really useful for prospective holiday-makers. We are really glad you had a good time and were able to relax with the children, not worrying about them disturbing anyone. Also pleased you share our taste in homeware! Hope our CD collection does not date us too obviously!! We had a wonderful 2 weeks at Casa Isabella. The setting is so secluded and peaceful, the house being in such a private location. The villa itself was perfect for our family of 5 with 4 good double bedrooms and large bathrooms on both floors and very quickly felt like a home from home. The house and pool were taken care of regularly and the owners provided us with comprehensive information prior to our trip. As recommended we made good use of local shops particularly the 'Rosticcheria' in Montegiorgio and found a range of supermarkets useful.We were lucky to have perfect weather for 14 days, and the surrounding area is very beautiful. We really didn't want to leave! So pleased the holiday was a success, and that you made the most of all that Montegiorgio and its surroundings have to offer. Also really glad that the house provided you with what you needed for a relaxing stay. Many thanks for taking the time and trouble to write up your experience of Casa Isabella! The house is ideally located between the beautiful Sibillini mountains and the charming sandy Blue Flag seaside resort of Porto San Giorgio. It is a 5 minute drive/good 20 minute walk from Montegiorgio, a bustling market town, with a variety of shops selling local produce, including the rosticerria for tasty home-cooked dishes and fresh pasta. There are bars, a pizzeria, spaghetteria and also many wonderful restaurants close by. Why not sample the local Verdicchio and Rosso Conero wines with a beachside fish supper. Montegiorgio has a bank/cash point, chemist and hospital. For art lovers, you will find the work of Crivelli and his followers all over Le Marche, and much to admire in Raphael's birthplace, the magical Urbino in the North of the region. Why not stroll around the antiques market in Fermo 30 minutes away, or the elegant university town of Macerata (35 minutes) with its renowned opera festival. We are also a short drive from the Prada and Tod's outlets, amongst others. Booking is secured with a non-refundable 25% deposit. Full payment is required 8 weeks before arrival date. We also ask for a £300 security deposit, returnable after the property has been checked on departure. Payment by cheque or bank transfer.